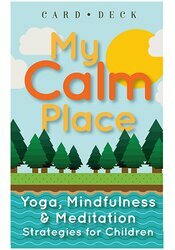 My Calm Place card deck combines yoga, meditation, mindfulness and guided imagery activities to calm emotions and promote self-regulation in children. Fun and easy-to-use, these 50 exercises are perfect for the classroom, clinic or at home. Barbara Neiman, OTR, is an Integrative Occupational Therapist, Yoga Teacher 200RYT in Embodyoga®, a coach for professionals seeking a holistic practice and a National Seminar Presenter. She teaches courses on Yoga and Mindfulness around the country. She founded her company, Health Discovery, to provide services for infants through school age children. As a Certified Practitioner of Body Mind Centering® since 1989, Barbara has taught experiential hands on, movement, and meditation classes. She offers training to schools and businesses on applying yogic interventions to classrooms and corporate settings to reduce stress, improve focus and self-acceptance. Sheila Lewis writes curriculum for national organizations, has designed over 60 badge programs for Girl Scouts USA, tutors, and runs book clubs for middle grade students, using whole brain strategies. On the faculty of JCC Manhattan since 2005, she teaches meditation classes, creativity and writing workshops. She is the co-author of Stress-proofing Your Child. As the mother of two grown sons, one on the autism spectrum, she has been a parent advocate on various committees.